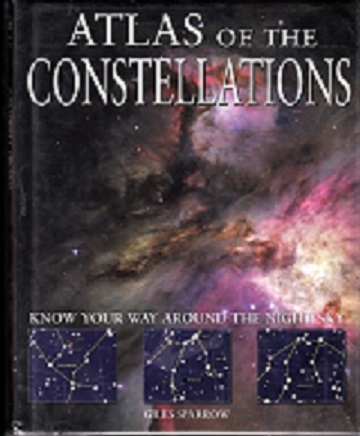 Atlas of the Constellations published in 2007. The Blurb: The night sky has fascinated mankind for millennia, inspiring religions and astrology and providing a basis for navigation and timekeeping. The ancient Babylonians named the first constellations after their gods and myths, providing us with the twelve signs of the zodiac, and the ancient Greeks named many other northern hemisphere constellations. Sixteenth century explorers identified similar star patterns in the southern hemisphere and by the 1750s astronomers had given names to all of the 88 constellations we recognize today. Featuring accurate and clear star charts covering the northern and southern hemispheres, the Atlas of the Constellations is a fascinating introduction to astronomy. Beginning with a brief introduction to the stars, this book features one full page on each constellation, detailing its naming and mythology, location in the sky, the best times of the year to view it and its key stars and nebulae. Comprehensive and informative, the Atlas of the Constellations will enable every reader to unlock the secrets of the night sky.